This is a model of an RhB (Rhaetian Railroad) class ABe 8/12 "Allegra" powered rail car train. The paint and lettering are prototypical for Era VI. The model has traction tires and is driven on four wheelsets by two ball bearing Bühler motors. It has an mfx/DCC sound decoder with many sound and light functions. The pantographs can be raised and lowered digitally on both end cars. All the cars on the train have metal wheels, and the center car has wheelsets with ball bearings. All the doors can be opened. The model has many separately applied details such as conductors, plugs, windshield wipers, antennas, and rear-view mirrors. 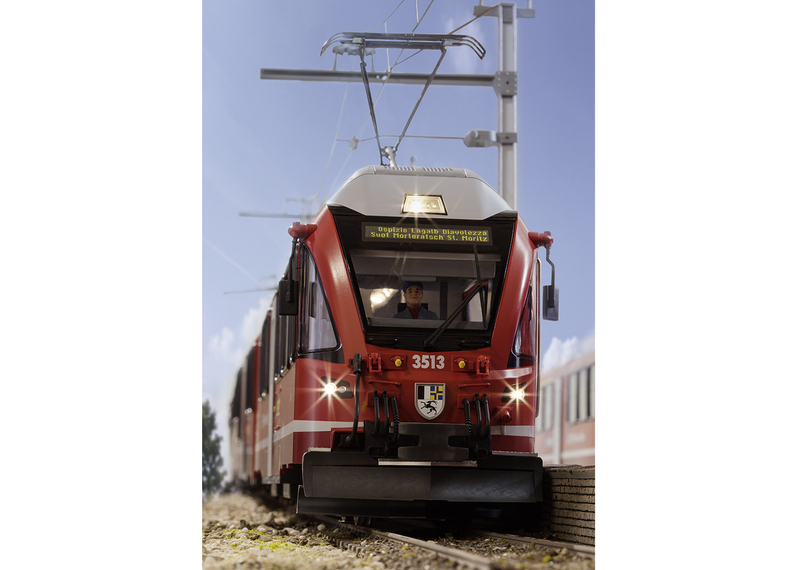 The model has sprung buffers and complete rail clearance devices (the center part of the rail clearance devices can be replaced with a standard LGB coupler that is included with the train). Length over the buffers 206 cm / 81-1/8". LGB 22225 – RhB Class ABe 8/12 "Allegra" Powered Rail Car Train On October 14, 2009, the Rhaetian Railroad (RhB) set a new milestone in its tradition-filled history, because the first of 15 new three-part dual system powered rail car trains (11 kilovolts /16.7 Hertz and 1 kilovolt DC), the class "ALLEGRA", was festively received on this day in Landquart. The new train is not only highly modern, but it also conceals significant innovations and a lot of power inside. All the wheelsets are powered in both end cars. The multi-system drive equipment consists of 4 drive trains with water-cooled IGBT rectifiers and produces 2.6 megawatts / 3,485 horsepower with AC voltage (2.4 megawatts / 3,217 horsepower with 1 kilovolt DC). That is extremely high because the most powerful RhB locomotive, the high-performance class Ge 4/4 III, offers "only" 3.1 megawatts / 4,155 horsepower of performance. With 8 powered wheelsets and its performance, the "ALLEGRA" develops a correspondingly high tractive effort of 260 kilo newton / 58,450 pound-force, which exceeds that of the Ge 4/4 III by 30%. 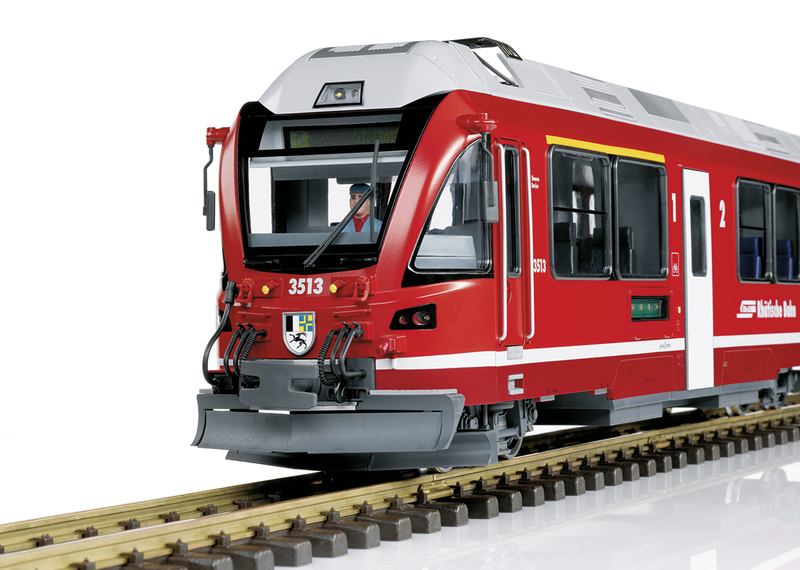 With it, the builder Stadler succeeded in creating a unique meter gauge powered rail car train in the entire world in terms of power density, performance, and weight. One special challenge here was to "stow" the power packets in the limited space beneath the powered rail car floor and on the roof, which also succeeded thanks to innovative solutions. The non-powered intermediate car offers comfortable entry with its depressed floor area, a handicap-accessible toilet, and storage space for baby strollers. 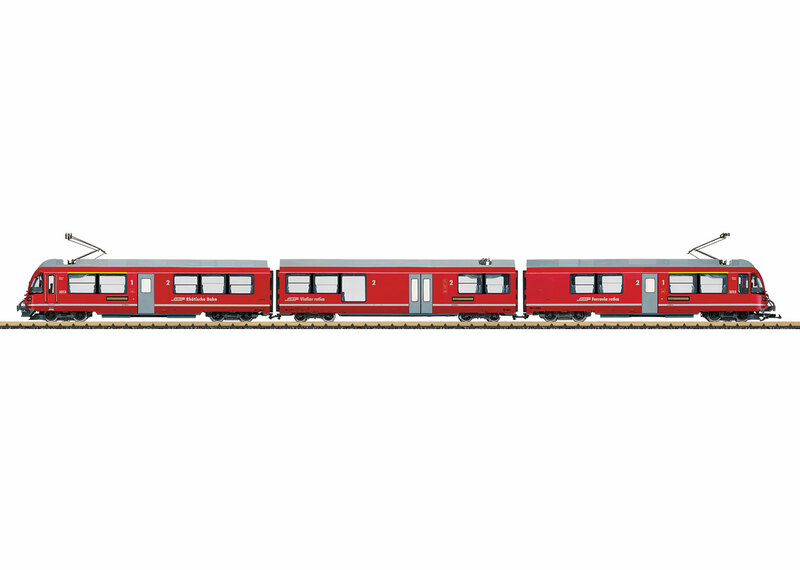 There is space in the class ABe 8/12 with its fully air conditioned passenger areas for 24 seats in 1st class and 76 seats in 2nd class as well as additional fold-down seats and standing room. A modern passenger information system with flat screens is also standard. 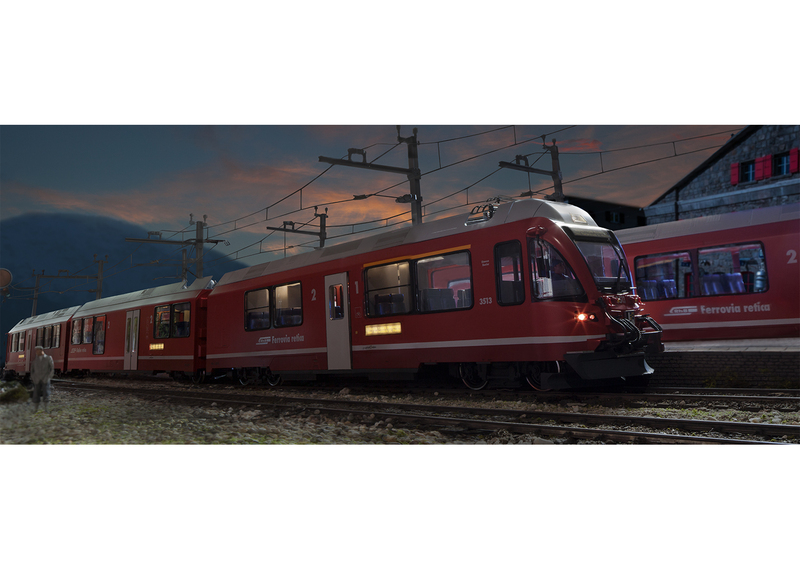 The ends of the powered rail car trains with the Grisons canton coat-of-arms lends the lower part of the cab with its shape coming to a point and the straight cab windows arching to the back a certain sharp edged look and it also symbolizes its power. The "ALLEGRA" can also claim a speed record for meter gauge trains because on December 20, 2010 unit 3502 reached a proud 145 km/h / 91 mph on a special run in the Vereina Tunnel.